Mount Sinai is a 2,285-metre (7,497 ft) high mountain near Saint Catherine in the Sinai region. 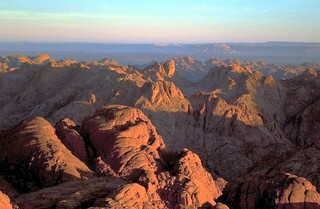 It is next to Mount St. Catherine (at 2,629 m/8,625 ft, the tallest peak on the Sinai peninsula). It is surrounded on all sides by higher peaks of the mountain range. lies on the Sinai Peninsula, at the mouth of an inaccessible gorge at the foot of modern Mount Sinai in St. Catherine city in Egypt at an elevation of 1550 meters. The monastery is Greek Orthodox and is a UNESCO World Heritage Site. According to the UNESCO report ( this monastery has been called the oldest working Christian monastery in the world – although the Monastery of Saint Anthony, situated across the Red Sea in the desert south of Cairo, also lays claim to that title.